A3 – is a creative group of architects and interior designers who works closely with leading companies in the hotel and recreation management and marketing, engineers and construction companies. Design for us - it is primarily the idea that we are trying to implement in accordance with the functional purpose of the facility and its landscape position. Each next object is a new, undivided image, a new expression of previously acquired experience. Considerable practical experience gained by us in the design and construction of several four and 5-star hotels and recreation facilities in the Carpathian region (Yaremche city, Bukovel village). Implementation of bold architectural solutions in difficult landscape conditions using modern technologies and building materials combined with traditional for this region "wooden building" materials (timber, frame, shingle, "wild" frame) required great efforts and close cooperation of our entire team. As a result - these objects got unique and exclusive style, architectural and volumetric solution that combines wooden beams, and sometimes a "wild" frame facade with structural glass, reinforced concrete, and natural shingles and so on. In our interiors dominate usage of rich classical motives and folklore, made exclusively from natural, high quality materials, which are made mostly on request. An important element in realization of our recreation facilities complexes is high-quality execution of constructional and decorating works, because each our object is a complex engineering system and non-standard design solutions. Qualitative and expected by Investor result requires coordinated work of the project team, which performs regular author and technical supervision with selected qualified craftsmen teams. 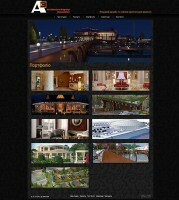 Website for the architectural and design group "A3"